2013 Bowman baseball is loaded with top prospect autographs including: Byron Buxton Carlos Correa (2015 Rookie of the Year) Gregory Polanco Lucas Giolito Taijuan Walker Yordano Ventura. Configuration: 12 boxes per case. The answer is 2013 Bowman Baseball! Bowman continues to feature Chrome and Base Prospect and Rookie cards, along with unique autographs, relics, and inserts. This year is the 65th anniversary of Bowman, and we are going to celebrate throughout the season with a Blue Sapphire Refractor program. Be sure to get in on the ground floor, to be among the first collectors to own this year's edition. Every Box will include 1 Autographed Card Each pack contains - five (5) 2013 Bowman Baseball Cards - two (2) Prospects - two (2) Bowman Chrome Prospects - and one (1) Base Gold Parallel Card. PRODUCT DESCRIPTION BOWMAN'S TOP 100 PROSPECTS Bowman ranks the top 100 prospects with help from the Bowman Scouts. Die-Cut Refractor Parallel - sequentially numbered to 99 Autographed Die-Cut X-fractor Parallel - X-fractor version sequentially numbered to 24 Autographed Die-Cut Atomic Refractor - Patterned Refractor version numbered 1/1 Hobby Only CHROME REFRACTOR MINI CARDS:"CREAM OF THE CROP" Chrome Refractor Mini cards highlight the top 5 prospects in each farm system. Blue Parallel - Sequentially numbered to 250 - Red Parallel - Sequentially numbered to 5. Hobby Only - Superfractor Parallel - Sequentially numbered 1/1. Hobby Only CONTINUITY PROGRAMS Blue Sapphire Refractor Program To celebrate Bowman's 65th anniversary, Bowman will launch a continuity program that features some of the top players of all time, as they were first featured in Bowman on reprints of their 1st Bowman Card. The Bowman Black Collection (25 Subjects): Bowman Black is back! Subjects sign black paper cards with a silver pen. Cards will be numbered to 25. Hobby Only Dual Franchise Refractor Autographs Autographed Dual Refractor cards featuring 2 top prospects. #'d to 25 or less Futures Game Relics Jersey relic cards from the 2012 SiriusXM All-Star Futures Game, #'d to 25 Ultimate Prospect Autograph card Featuring up to 25 prospects on one card! Hobby Only AFLAC/Perfect Game High School All-American & Under Armour All-American Game Autographs. 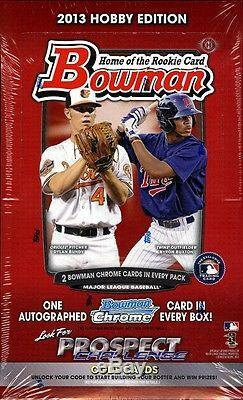 Hobby Only BOWMAN CHROME AUTOGRAPHED ROOKIE CARDS Autographed variations of the base Rookie Cards on Chrome technology. Refractor version: Sequentially numbered to 500. Blue Refractor version: Sequentially numbered to 250. Gold Refractor version: Sequentially numbered to 50. Orange Wave Refractor version: Sequentially numbered to 25. Red Refractor version: Sequentially numbered to 5. Super Fractor version: Sequentially numbered 1/1. Jumbo Box Only BASE CARDS Veterans: The top MLB veterans Rookies: First Year MLB players; cards will feature the MLB Rookie Card logo. State & Home Town Parallel - Gold-Bordered - Blue-Bordered: numbered to 500. Hobby Only - Silver Ice Parallel: 1 per box; 2 per Jumbo box. Red Ice #'d to 25 Hobby Only Purple Ice #'d 10 Hobby Only White Ice #'d to 1 Hobby Only Prospects - MLB prospects. These will be numbered BP1 - BP110. State & Home Town Parallel - Blue-Bordered: numbered to 500. Hobby Only - Red Ice #'d to 25 Hobby Only - Purple Ice #'d to 10 Hobby Only - White Ice #'d to 1 Hobby Only CHROME PROSPECTS Bowman Chrome Prospects Subjects from the prospects insert will have Bowman Chrome versions. Refractor Parallel: #'d to 500. Blue Refractor Parallel: #'d to 250. Gold Refractor Parallel: #'d to 50. Orange Refractor Parallel: #'d to 25. Red Refractor Parallel: #'d to 5. Hobby Only - Super Fractor Parallel: #'d to 1/1. Hobby Only Autographed Bowman Chrome Prospects Autographs of MLB prospects. Cards will have the following parallels. Hobby Only - Refractor: #'d to 500 - Blue: #'d to 150 - Gold: #'d to 50 - Orange: #'d to 25 - Purple: #'d to 10. JUMBO BOX Only - Red: #'d to 5 - Super: #'d to 1 - Printing Plates #'d to 1. JUMBO BOX Only OVERSIZED 1948 AUTOGRAPHED BOWMAN CARDS Inserted as Box loaders #'d to 20. Each Contract recipient gets an autographed baseball from a top prospect - Grand Prize winner gets a card in 2014 Bowman release LUCKY 5 REDEMPTION PROGRAM Five different limited redemption cards good for a special bonus card. Check out my other items. The item "2013 Bowman Hobby 12 Box Case Factory Sealed CORREA BUXTON" is in sale since Saturday, November 21, 2015. This item is in the category "Sports Mem, Cards & Fan Shop\Cards\Baseball". The seller is "jaydub2001" and is located in Arvada, Colorado.